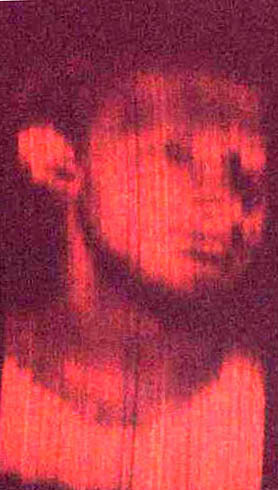 This is an actual television picture taken by Mr. Steve McVoy, as displayed on his 1930 operating 30-line Baird mechanical television set. The image is about half the size of a business card! When viewed in person, the image has more detail, and appears crisper to the eye. The light output is low and extremely difficult to photograph. The "Picture Tube" for mechanical television sets was a special NEON LAMP, called a "Kino Lamp". An example is shown here. This neon tube sat behind the rotating aluminum disk in the TV receiver (TV shown below). The disk has a spiral series of square pinholes near the outer edge. When this disk is spinning, the square pinholes 'scan' the surface of the neon Kino lamp. The lamp varies in brightness depending on picture information transmitted from the TV station at each instant in time, for each picture element. Important note: If you look at the neon tube (behind the spinning disk) while any mechanical TV set is being operated, you will see nothing but a flickering neon light - no image. The image is created by the holes in the scanning disk passing in front of the neon. The surface of the neon does not display a composite picture, but only pulsates (flickers) as it recreates the intensity of each picture element. Through 'persistence of vision', the human eye assembles all of these picture elements and sees a total picture. You may have to think about this for a while to understand it. Click here for a picture layout of a mechanical television system, so you can study the operation. Some mechanical sets used a "crater" lamp, which was a neon with a high intensity point light source. A magnifying lens was used to broaden the beam so that the picture area on the disk (or mirror drum on some systems) was fully illuminated. 1930-33 Baird "Televisor" TV Set - From an advertisement. Image of girl is pasted into picture and is not representative of size, exact viewing position or quality. WATCH & HEAR THE BAIRD TELEVISOR IN OPERATION !! ALSO LEARN HOW TV WORKS !! Click this link >> Origins of Television << for an 11-minute streaming video ("Real Player" software needed), for either 56K "dial-up" or broadband (cable, DSL) connections (click the appropriate knob on the TV-set to start the movie). Video courtesy of Paul Schatzkin. Take time to visit his "farnovision" site and learn more about Philo T. Farnsworth. Actual "Televisor" from the UK (Courtesy Steve McVoy) - This is the world's first "mass-produced" TV set to be sold to the public (about a 1000 were sold). Some collectors consider this to be the first TV set in the world, but technically, Baird had earlier sets for sale in 1928.